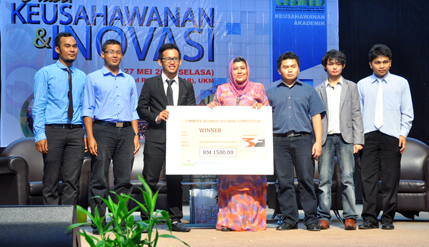 BANGI, May 27, 2014 – The Faculty of Education emerged as the overall champion in the Entrepreneurship and Innovation Day competition organised by the Centre for Entrepreneurship and SME Development of The National University of Malaysia (UKM-CESMED). Some 3,000 students from all the 13 faculties took part in the competition involving 23 types of businesses at the Dewan Canselor Tun Abdul Razak (DECTAR) here today. About 600 Business Simulation Companies had competed in four categories of the competition, which became an annual event since 2011. The Faculty of Education clinched all the three top places for the Business Mogul Simulation category and thus became overall winner of the championship. The Business Concept Competition was won by the Faculty of Economics and Management with the Faculty of Science and Technology as the runner-up. The Faculty of Engineering and Built Environment came in third. For the One-Minute-Business-Pitching category, Carameo Entreprise took first place while Gogo Steamex emerged runner-up while third place went to Mudzalifah Enterprise. In poster designs, the Faculty of Education took first place, followed by the Faculty of Information Science and Technology, with the Faculty of Health Sciences coming in third. CESMED Director Professor Mohd Fauzi Mohd Jani said the programme is aimed at inspiring and nurturing student interest in entrepreneurship while encouraging them to be innovative, creative and competitive. Speaking at the opening ceremony, Prof Fauzi said UKM- CESMED offers four courses for all UKM students whose instructors are UKM-CESMED fellows from all faculties who teach entrepreneurship courses. “The programme is structured in such a way as to allow students to gain exposure to entrepreneurship knowledge so that by the time they are in the final year they would be able to establish and operate their own companies,” he said. UKM-CESMED Deputy Director of Academic Affairs Prof Dr Rosilah Binti Hassan officiated at the closing ceremony later in the day.